The rustle of the corn stalks on a sunny Iowa summer afternoon. The crunch of gravel under the big wheel of a John Deere tractor. The majestic sight of rolling hills and an endless sky, as far as the eye can see. These sights and sounds of a working farm family were brought to virtual life with the help of a Newhouse student and a professor in a recent groundbreaking moment in journalism. Irfan Uraizee ’15 and Dan Pacheco, Peter A. Horvitz Endowed Chair in Journalism Innovation, worked on the Des Moines Register’s extensive editorial, pictorial and virtual series, Harvest of Change. As part of the series, readers can figuratively “jump into the story,” says Uraizee. With the help of Gannett Digital media, the Register used 3D game interaction and 360-degree video to tell the story. The story itself literally revolves around a farm family in Page County, Iowa, and the 21st century methods and challenges they face in one of the world’s oldest professions. 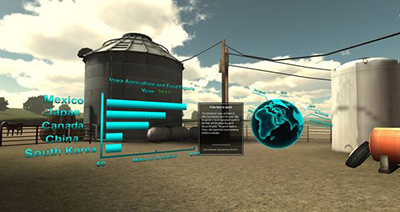 Newhouse student Irfan Uraizee helped create virtual charts like this to better explain the story in the virtual reality world. An Oculus Rift virtual reality viewer is used for the full 3D effect. It’s basically headgear with a viewing screen that puts the reader on a farm, allowing movement from barn to hay bale to tractor. At each stop an icon appears, and by pressing a button on a handheld video game controller, the user opens up video clips, charts to better explain concepts like farm exports, or even game tokens, adding a gamification element to the experience. Users can also, in a virtual reality sense, move around within the video clip simply by moving their head to the left, right, up or down. Pacheco sees this as one part of a growing field of what he calls Experiential Media. Over the next decade, media will increasingly move into our environment, and we will move into media, Pacheco says. Your body itself, rather than a mouse, computer or phone, will increasingly become the primary mode of navigation through content. “What’s really groundbreaking here,” according to Pacheco, “is the merging of techniques from the gaming industry with cutting-edge technology in the form of 360 video (like Google uses for Google maps) in which cameras pointed in all directions capture the video at once and then it’s stitched together.” At different points of the experience, the user fades from a place in the virtual scene to a 360-degree video in the same place, then back into the virtual. You can view a 2D version of the project here. Holodeck at Newhouse Part of Virtual Reality Storytelling Project from Syracuse University News on Vimeo.